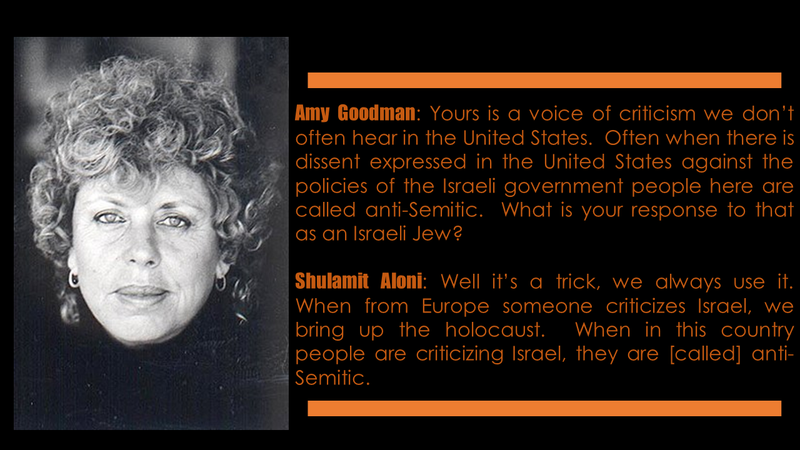 In an interview with Democracy Now’s Amy Goodman, the following exchange took place with former Israeli Education Minister Shulamit Aloni. Amy Goodman: Yours is a voice of criticism we don’t often hear in the United States. Often when there is dissent expressed in the United States against the policies of the Israeli government people here are called anti-Semitic. What is your response to that as an Israeli Jew? Shulamit Aloni: Well it’s a trick, we always use it. When from Europe someone criticizes Israel, we bring up the holocaust. When in this country people are criticizing Israel, they are [called] anti-Semitic. 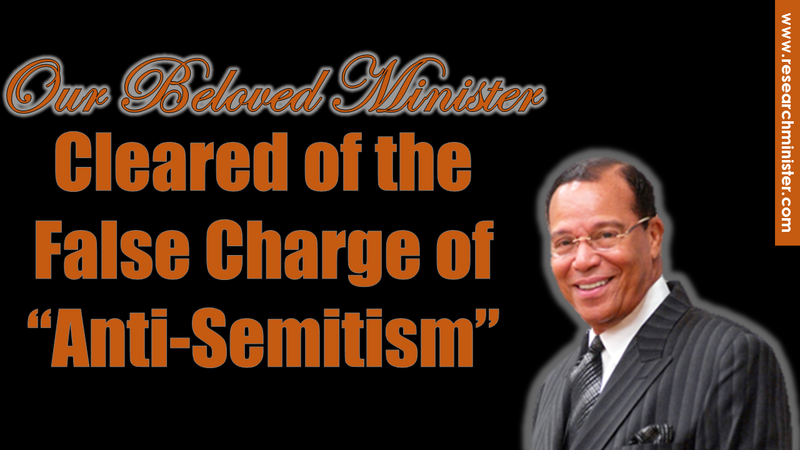 What Ms. Aloni is describing is the very skullduggery used against the noble work and reputation of the Honorable Minister Louis Farrakhan and the Nation of Islam. Minister Farrakhan remains the beloved champion of truth and heroic strong man of the liberation struggle for poor and oppressed peoples around the world. Yet the price he has had to pay for speaking the truth is to suffer being called an anti-Semite and all that comes with that negative designation. However, those who have falsely accused the Minister have actually revealed more about themselves and their true motives and intentions. A deception. Trick, artifice, ruse, stratagem, and wile are terms for crafty or cunning devices that are intended to deceive; an underhanded act designed to cheat someone; an artifice of diabolical ingenuity. 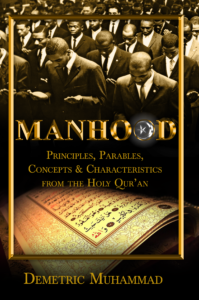 The Most Honorable Elijah Muhammad taught that both the American slave master and the European colonizer of the Black, Brown, Red and Yellow peoples of the Earth did so using the science of “tricks and lies.” Minister Aloni has confirmed the Most Honorable Elijah Muhammad’s teaching in this regard by revealing one such trick that has been used against Minister Farrakhan and strong Black leaders throughout history. More plainly, the trick has been on the general public who are forced to admire, respect, support and even love Minister Farrakhan in veritable secret, or otherwise suffer by being accused of allowing their admiration to provide legitimacy for an alleged “anti-Semitic hate teacher.” Some are affected by the trick to the point that they have developed outright negative opinions of Minister Farrakhan on the basis of his criticism of Jewish influence. But to raise legitimate criticism to the level of anti-Semitism is fallacy known as the straw man fallacy. When legitimate criticism is mischaracterized as anti-Semitism, it is done obfuscate or hide real issues. The so-called anti anti-Semitic watchdog groups have even been condemned by avowed Farrakhan-critic Rabbi Michael Lerner. In his book, co-authored by Dr. Cornel West titled Jews and Blacks: Let the healing begin he writes. 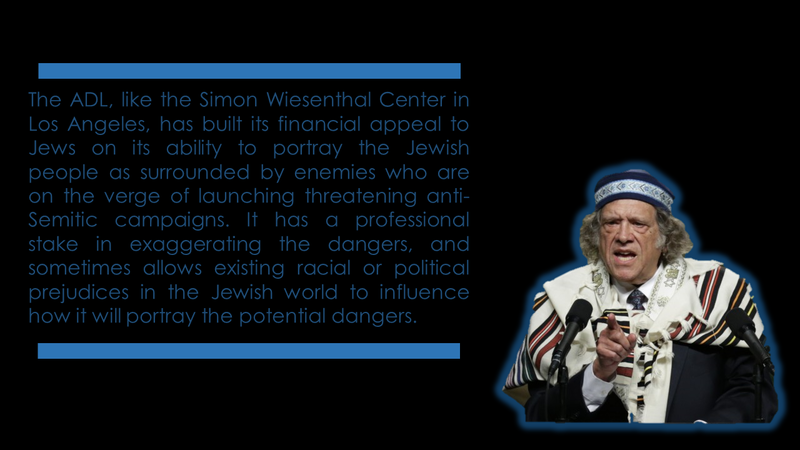 The ADL, like the Simon Wiesenthal Center in Los Angeles, has built its financial appeal to Jews on its ability to portray the Jewish people as surrounded by enemies who are on the verge of launching threatening anti-Semitic campaigns. It has a professional stake in exaggerating the dangers, and sometimes allows existing racial or political prejudices in the Jewish world to influence how it will portray the potential dangers. In the mistreatment of Minister Farrakhan by groups like the ADL and the Simon Wiesenthal Center, Black people en masse have been the real victim. For all of the economic programs and unity efforts advanced by Minister Farrakhan to uplift Blacks in America from poverty and want, have been undermined by these groups whose efforts are no less racist and Anti-Black than that of the Ku Klux Klan. Maybe this is why when in 1991 Klan wizard David Duke ran for governor of Louisiana, the ADL was mute, claiming that their tax-exempt status prevented them from intervening in a political campaign. A few weeks ago, I had an expose [sic] on Jesse Jackson. Quite, by coincidence, I wasn’t aware of it, we had one of those mass mailings going out for fund raising. It was one of those mailings to lists that were not our usual givers. The fund-raising people tell me that in the several weeks following—these were small gifts, $20, $100, but there were many of them—we never had the response to a mailing that we had in our July, 1984 mailing. Author Micah L. Sifry in his 1993 article in The Nation magazine entitled Anti-Semitism in America seeks to hold these anti anti-Semitic groups accountable for their blatant hypocrisy in demonizing Blacks who are critical of their political and economic activities while at the same time, explaining away negative Jewish criticism made by whites. Yet when Minister Farrakhan said that Hitler was “wickedly great,” (literally: one who is unusual or considerable in degree, power, intensity, in the practice of evil) the ADL and Wiesenthal Center used that harangue the Minister in the media and undermine his economic initiatives. Fred Malek, a high-level adviser to then-Vice President Bush had given President Nixon a list of Jews in the Labor Department, some of whom then lost their jobs. In the light of this problematic history of the much-feared charge of anti-Semitism, the fair-minded observer is able to see clearly that what is motivating the use of this charge is not any real threat to the Jewish people and not any real anti-Semitic behavior. For when Jews in the Nixon administration lost jobs and income due to his anti-Jewish actions, he was still deemed a friend. 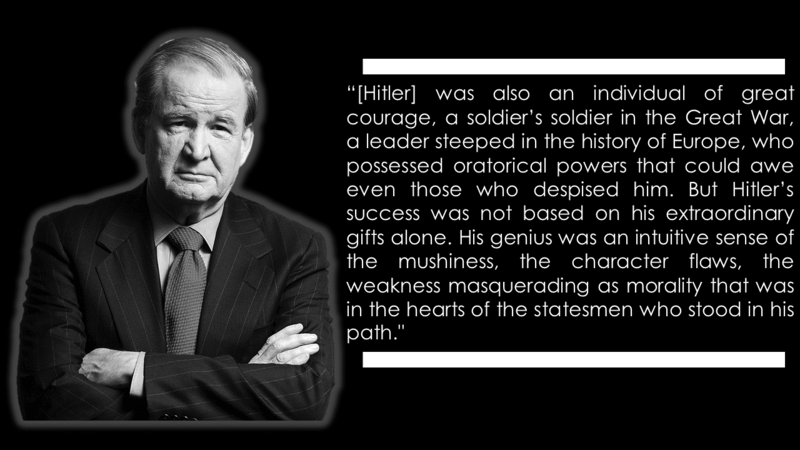 When President Reagan and Pat Buchanan equaled the pain of German SS soldiers to those who were their victims, they are not even held accountable for such offensive behavior. So, all we have left is the traditional tried and true blue racism that Black people have never had the luxury of being forgetting about. It is the same scapegoating of Blacks that has proven to be a money-maker whenever those in power can make those they influence to give them money in the name of protecting them from a Black boogeyman. Its time-out for these games and wasting of time and resources. If Minister Farrakhan is speaking falsehood, then all you have to do is respond to his call for a public showdown with him and defeat his falsehood with your truth.